UPDATE: The street dedication for Frances Hashimoto Plaza has been changed to Thursday, Nov. 15 at 10 a.m. in Little Tokyo. There will be no ceremony on Monday, Oct. 1. For more information, contact email [email protected] or call (818) 203-2779. Pinkberry may be on the corner, but a plaza in Little Tokyo will now be associated with a uniquely Japanese American treat: the chewy, sweet taste of mochi ice cream. Frances Hashimoto, CEO of Mikawaya, whose signature desserts include the icy treat, will be honored with a plaza named for her at Second and Azusa streets, site of Pinkberry, Firefly T-shirt shop and Rafu Bussan. 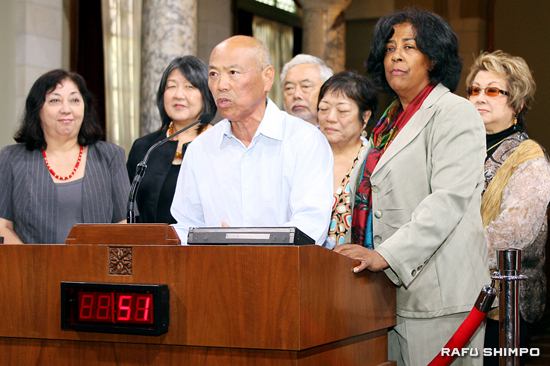 The Los Angeles City Council voted unanimously on Tuesday for the motion introduced by Councilmember Jan Perry. The motion now goes to Mayor Antonio Villaraigosa for final approval. Perry cited Hashimoto’s leadership in a number of Little Tokyo organizations, as well as her success in business. Her impact has long been felt in Little Tokyo, from leading the Nisei Week delegations to Nagoya to the boxes of manju donated by Mikawaya and served at community meetings and events. A Boyle Heights native, Hashimoto worked as an elementary school teacher for four years before entering the family business full-time. In 1970 she became CEO of Mikawaya, which has expanded to include five retail stores, a bakery, a warehouse and an ice cream manufacturing facility. Perry presented the motion, which was also supported by Councilmembers Jose Huizar and Bernard Parks. Earlier this year, Hashimoto was awarded the Order of the Rising Sun, Gold and Silver Rays by the Japanese government for her efforts to promote U.S.-Japan relations. A small group of supporters were on hand to show their support, representing organizations including the LTBA, Nisei Week Foundation, Japanese Chamber of Commerce of Southern California, and Little Tokyo Business Improvement District. James Okazaki, representing Nisei Week, noted that Hashimoto will join other important Nikkei leaders who have had city streets dedicated in their honor, including Judge John Aiso and astronaut Ellison Onizuka. He said it’s appropriate to rename the plaza for Hashimoto because it serves as part of the “spine” that runs from the Japanese American National Museum through Japanese Village Plaza to the Japanese American Cultural and Community Center. 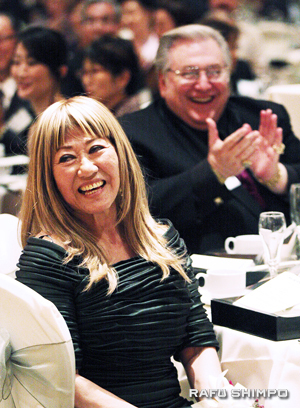 “I consider her a local hero, comparable to Onizuka and Judge Aiso,” said Okazaki. The Department of Transportation will be directed to place a permanent ceremonial sign in the plaza, pending the mayor’s signature. An unveiling of the street sign is tentatively set for Monday, Oct. 1, at 11:30 a.m. Anyone interested in attending is asked to email [email protected] or call the Nisei Week office at (213) 687-7193.